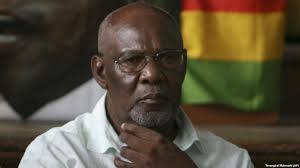 ZAPU president Dumiso Dabengwa has for over a month now been sidelined from hectic political activity as he has been holed up in South Africa where he was flown after his health reportedly deteriorated late last year. Dabengwa, a strong Zanu PF critic, has been in South Africa since December last year with then party national chairperson Isaac Mabuka assuming the position of acting president. Zapu national spokesperson Iphithule Maphosa yesterday confirmed to Southern News that his boss is currently receiving medical attention for an undisclosed illness in the neighbouring country. “I can confirm he is facing health challenges but he has been attended to by South African doctors and he is in good spirits,” said Maphosa while refusing to give more details. He, however, dismissed rumours that Dabengwa was bed-ridden. “He is not admitted in hospital. Neither is he bed-ridden. He was supposed to undergo an operation but it was deferred for medical reasons. We wait for the new dates while he is at his home in South Africa. He is the usual DD we all know, in his high spirits,” Maphosa said. Dabengwa joins a bandwagon of high-profile Zimbabwean nationals who have always sought medical remedy in the neighbouring country. Meanwhile, the Zapu national spokesperson has gone into self-exile in Namibia following the shutdown which turned violent last month, resulting in a crackdown by the country’s security forces. Maphosa claims he was forced to flee after security details allegedly invaded his house in the evening. He claimed the soldiers and police first came, searching for him in connection with the protests, but were told he was out of the country having left on January 6. Maphosa further said he returned home on January 20 but had to flee the same night after four police officers returned the same evening he had returned. “As they were at the gate trying to gain entry, I hurriedly sneaked out by jumping the precast wall into the neighbour’s yard and fled,” he said. “I was never part of the demonstrations so it dawned on me the regime could be having a hit list and were using the stay-away as cover for targeted persecutions,” he said. Maphosa, however, said he was not feeling safe in Namibia as “we all know how the Zimbabwean regime invested in secret service.